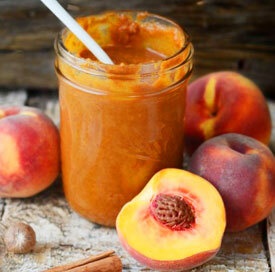 Because a fruit butter does not depend on pectin to set, the proportions of fruit to sugar can be varied. I like mine slightly less sweet than jam (which still leaves plenty of room to be sweet). The spices also can be increased or decreased to taste. Combine the prepared fruit and the lemon juice in a large enameled kettle and heat very gently until the fruit starts to release its juice. Simmer, stirring often, until it is tender. Puree the fruit in a blender, in batches of several cups, and return the puree to the kettle. Add the sugar and spices and simmer again, stirring often, until the mixture is as thick as you want it. This may well take an hour or two, so be patient. Add the brandy and cook for a few minutes more, just until the proper thickness is regained. Spoon the hot fruit butter into hot, sterile jars, leaving about 1/3 inch of headroom, and seal immediately. Makes 3 to 4 pints, depending on how concentrated you like it. We'd love to publish your favorite fresh peach recipe, too.